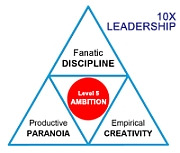 Leadership - What is Level Five Ambition? Are you like me wondering what Level Five Ambition looks like? Do you wonder if you have the makeup to have it? Is it something to aspire to? If it is, can you develop the characteristics and habits to achieve it?